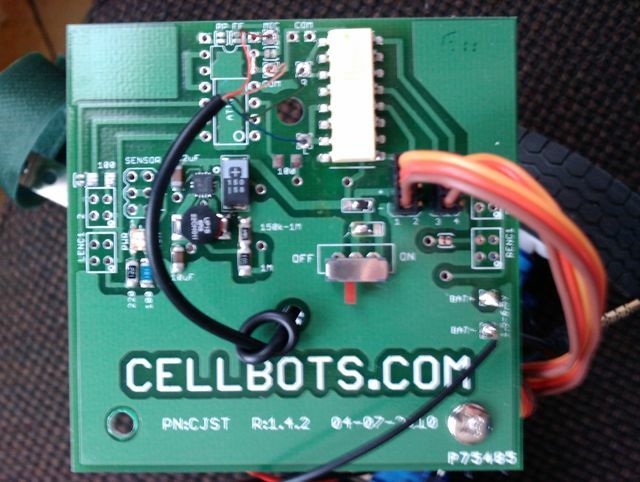 You can order this kit from http://www.cellbots.com/. It's a very basic kit and therefor very affordable. 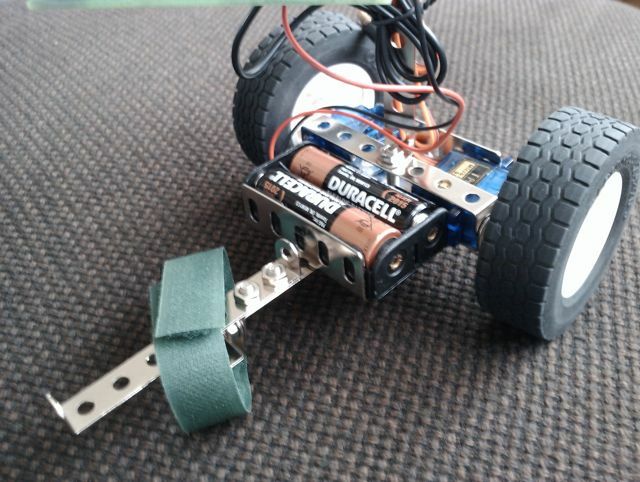 It contains all elements (except for the android phone that is :)) to built a robot powered by 2 AA batteries and moving on 2 smaller wheels and 2 cd's. It's controlled by an Android Phone connected with only the headphone connector. You can get a very basic application that lets you control the connected servo's from the screen. I just needed the logic board and the modified servo's for my own creation so I ordered. Once received (order well handled, did need to pay taxes over it since package claimed it's actual value) I immediately started building. I had some troubling finding written instructions next to the youtube movie referenced in the packaged documentation. Once found (check cellbots menu on the right) I started soldering. I had some practice by now :). The written instructions stated all TRRS connector (that is the sound plug on your phone) parts should be on a different circuit. My board had the mic and the com (ground) ports shorten. I asked this on the cellbots google group and quickly got an answer (like usual, great support from developers themselves). This is normal, check the google group for more information on this. It worked nonetheless. This is my board soldered and with 2 servo's connected. It's not completely according to instructions. I should have taken the notted cable from the TRRS connector through the hole near where it's soldered. My mistake but it's not in my way so I won't take the time to desolder. If you were building according to spec it would be in your way. The hole I used is ment to attach the battery holder to the board. So do it correct if you're building as is. Also the ground (black) wire of the BAT- connector should be on the other side of the board. I quickly fixed it since cable broke and this way I didn't have to desolder. Yes I don't like desoldering :). The board is not that hard to solder, you've got plenty of space. This is the construction I came up with. I posted about those wheels before. I got them from a technics set. You need part 32019 (the tires) and part 86652 (the wheels). 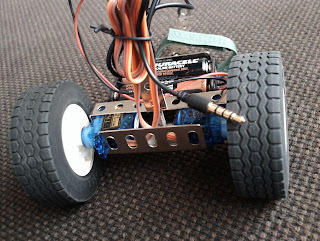 You can attach a servo rod with ty raps. The construction is hold together with metal parts from a cheap meccano like set. Not sure if you can still buy original meccano? The phone is mounted on the metal bracket in front using the velcro strap. It doesn't really have a front wheel. Instead I used some rubber to just sweep over the floor. Therefor it's not yet offroad enabled :). Next step is to work out some remote software. I can control it form the device already with this simple Servo Tester apk from the cellbots repository. I'll be working on a bluetooth application based on the bluetooth chat sample from the android api. Simply communicating commands like forward/backwards/turn left/turn right in order to control it form another android bluetooth device. I'll post the apk when I have something running.